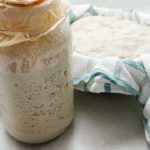 This gluten-free sorghum sourdough starter was created for a one-of-a-kind Simple Sorghum Sourdough bread recipe. If you’re curious about gluten-free sourdough bread baking, but you can’t consume rice flour, this recipe will be the one for you to try. The ingredients are simple, but the process requires daily feedings and options to customize along the way. Included in the step-by-step 7-day printable guide are some general tips and tricks to help you create your first starter. Print out the step-by-step 3-page guide to help you make your first gluten-free sorghum starter. If you have any questions along the way, you can ask them in the GFV Facebook group or below in the comments of this post. *Organic sorghum flour works best. Freshly milled sorghum works well. **Chlorinated tap water will not work. ***You can also use a doubled-lined cheesecloth or breathable clean cotton fabric.